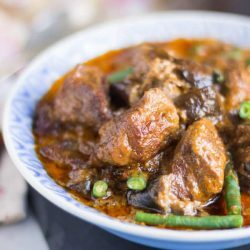 Thai Red Beef Curry is packed full of flavour, and so easy to make in the slow cooker. My version is crammed full of vegetables, so really only needs some steamed rice to accompany it. Double the recipe, stash the extras in the freezer, and you have a delicious meal in reserve. Turn the slow cooker to low to warm whilst you are preparing the ingredients. Heat 1 Tablespoon of the coconut oil in a large fry pan over a medium heat. Brown the beef a few pieces at a time. As the pieces brown, place them into the slow cooker. Heat the remainder of the coconut oil and brown the eggplant pieces in the same manner. Add these to the beef in the slow cooker. Add the curry paste to the hot fry pan and fry for 30 seconds, or until fragrant. Add the coconut milk, fish sauce and sugar to the fry pan and bring the sauce just to the boil. Tip all of the sauce into the slow cooker, scraping the fry pan well. Stir everything well to ensure that the beef and eggplant are coated in the sauce. Tuck the kaffir lime leaves under the beef. Place the lid on the slow cooker, and cook on low for 8 hours or until the meat is tender. Just before serving, bring a small pot of water to the boil and add the beans. Boil the beans for 2-3 minutes, or until they are tender. Drain the beans and gently stir them into the curry. I only use 1 Tablespoon of curry paste when making this dish as my preferred paste is quite spicy. Judge the amount you require on how spicy your paste is. Substitute any vegetables you like if eggplant and beans aren't your thing. The eggplant will cook right down into the sauce though so you won't notice it. You can substitute 1/2 cup of peas for the beans if you would prefer.